Last week, I blogged about a Turkish political blog which was geo-blocked by WordPress following a complaint from Turkish President Recep Tayyip Erdoğan. Yesterday, I tweeted my item at First Amendment lawyer Popehat aka Ken White, whose blog I recommend to anyone who wants to learn more about the intricacies of freedom of speech, after which it was re-tweeted by Laurence Tribe, a highly regarded Harvard Law Prof. whose former students include President Barack Obama and Senator Ted Cruz. 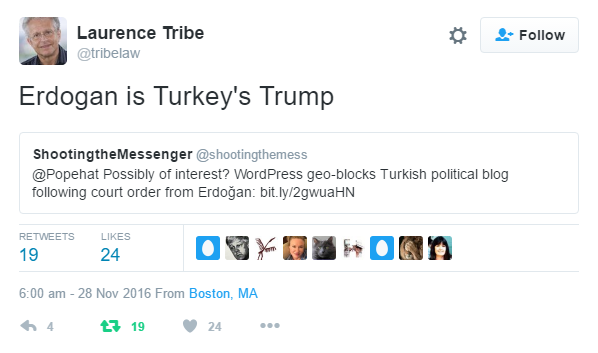 See also: “Erdoğan Strikes Again,” my November 27, 2016 item re: WordPress geo-block of Turkish political blog following court order by Turkish President Recep Tayyip Erdoğan.